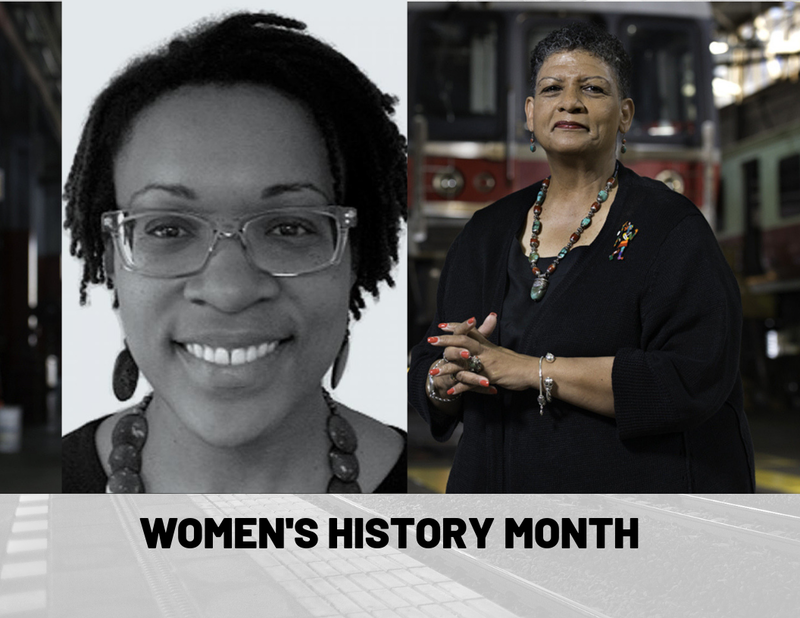 To celebrate Women’s History Month this year, we’re interviewing two social justice leaders about their perspectives on how inclusive infrastructure spending can advance the struggle for gender justice and equality. Beverly Scott’s career in the public transportation industry has spanned more than three decades of executive leadership in transportation agencies, and she is also the Vice-Chair of our Board of Directors here at Jobs to Move America (JMA). Anita Cozart is currently the Managing Director of PolicyLink, where she leads place-based, equitable development initiatives. Anita is also a member of our Board. Linda Nguyen (LN): What does Women’s History Month mean to each of you? Bev Scott (BS): For me, it’s really a time to reflect, a time of more internal retrospection. I have really been in the work world for 40 something years, and I can certainly see that there have been major changes. I always think about those whose shoulders we stand on. We have all the luminaries, people like a Rosa Parks. But there were so many silent people that you just don’t hear about that much. Somebody like [Jerrie] Mock, the first woman to fly [solo] around the world. Or [Arcola] Philpott, she was the first woman back in the 1940s that became a [motormanette] at LA Railways. There have been a lot of people whose shoulders that you know that you actually stand on. But it’s a period for me to reflect on where we’ve been, where are we today, and more importantly: where do we need to be? And how do we best get there? And always reflecting on what are we doing to make sure that we best equip, not just women but the next generations, to continue to make [progress], but to actually tangibly do more fix it. It’s one thing to reflect, it’s quite another to act. Anita Cozart (AC): I want to thank you all for taking a chance to reflect on what women’s month really means. It’s a powerful time and it’s important that we recognize it. For me, it reminds me of the importance of having a big vision and acting on that vision. And so I think about people like Mary McLeod Bethune, who dreamed of educating Black girls and boys after the civil war and was a dogged and stellar fundraiser for equality in schools and colleges that were dedicated to educating Black people. I also think about people like Mae Jemison, who dreamt that she could use her brilliant scientific mind to expand how we even understand outer space and its relevance to us. And she continues to inspire many people to pursue science and technology. For me, that’s important because I have two daughters who are both interested in that and having someone who dreams big and contributes to understanding of science provides inspiration to them. And then also, another person I think about is Shirley Anita Chisholm, and not just because I share part of a name with her, but she really dreamed that Black women would have a seat at the table in making decision about the prosperity, safety, and health of communities. She blazed a pathway for the hundreds and maybe thousands of women that are currently serving elected office including this last wave, that includes people like Sharice Davids and Lucy McBath, who are people that are inspiring me right now. I think that the key is that all of these women faced deep racism, and in some cases violence and threat birthed by those “isms”, and all of them have worked to dismantle the personal and systemic racism and sexism that threatened their dreams for themselves and their communities. Even more important and inspirational is how much they worked in partnership with others. And it’s just important to really have a big vision and summon the strength that’s within our grasp to really make our dreams real. And that’s what I reflect on this month. BS: You know, Anita, I know a lot of people who are very motivational, who even have a lot of integrity and principle. But the thing that I find in shortest supply is courage. And really the kind of courage that has you step out to be active. It’s not enough to think it, it’s not enough to just philosophize about it. In every one of the people that you noted, they took the additional steps to become actively engaged in moving and taking personal responsibility. This is just one of those periods that just lets you kind of reflect on those kinds of things. LN: Anita, you’ve championed policies that yield just and fair infrastructure investment and have spent your career as a planner thinking about equity, infrastructure, and transportation. There’s a pretty robust, ongoing conversation about the way we plan and design public transportation. But we also know that infrastructure and transportation can have a real impact on other aspects of women’s livelihoods. Can you tell us about the impact of that transportation and infrastructure have on women’s economic security? AC: Sure, and I’ll start by making it a little personal and then broadening it out to community and nation. This is personal for me because my sister and I were raised by a single mother. She worked long hours and was fortunate enough to be able to get the support of her family to get a graduate degree, which really catapulted her into an income bracket where she was really able to support us. But we definitely relied on a lot of specialized programs that were focused on getting women and women of color into science and technology fields. And for me, a key part of transportation is that for all of the programs I was involved with, I was given a transit subsidy to be able to get to and from each of the programs. These were programs with renowned science and engineering professors in the city where I grew up, Cleveland, Ohio. And for me, that really opened my eyes to the possibility of being able to be in a field related to how our communities are shaped and what are the technological influences that make our cities. Without that, I wouldn’t have been able to be in an economic secure position that I’m in right now. So, transportation was literally kind of that pathway for me. And I’m really not sure that without that transportation subsidy that I would’ve been able to take advantage of those programs, because they were not close to my home at all. And so in many ways, women of color particularly in this day and age, face significant economic insecurity. In many ways this has to do with historic barriers of women in the workplace, but even more it has to do with structural barriers related to unequal pay, lack of benefits, and economic penalties for caregiving. And the transportation sector, and portions of it, have brought some glimmers of hope. Because we know when women are in unionized, public transportation jobs, their incomes and benefits lead towards greater stability, and can be a stepping stone for some in terms of being able to build wealth. And moreover, when women have dependable transportation options, they can actually be able to travel to work and daycare and groceries without the costly expense of owning a vehicle. But many challenges still remain for women when it comes to accessing reliable transportation, and many women are finding themselves having to figure out and have uncertainty each day about whether or not their friend or neighbor or family member can give them a ride to work, whether or not they’re going to have to rely on a transportation system that may be underfunded, or whether they’re going to have to find their way through what can be a confusing and unpredictable on-demand transportation service. And even more, the components of being able to get a job in the transportation sector or a contracting opportunity, there are still challenges that are faced there. And while mentorship is important, even more important is the tools of local, state, and federal policy to really target jobs and opportunities to women. A great example is in Los Angeles, at the urging of the LA Black Worker Center, transit officials in LA County have been prioritizing hiring of local residents along the Crenshaw light rail corridor, and so that people in the community are actually benefitting economically from the project in addition to the additional accessibility. And lastly, I just want to say something about entrepreneurship. It’s really important for people of color as it relates to closing the racial wealth gap, which has resulted because of the economic insecurity that exists, because not only can entrepreneurship be a stepping stone towards wealth building, these are the firms that more often are going to hire people of color or low income people versus some of your white-owned firms. LN: Bev, you’ve been working in transportation for decades. When you reflect on our transportation systems and public infrastructure in the U.S. as you’ve seen it evolve over the course of your career, what do you think that governments, communities, and businesses can be doing better when it comes to advancing gender justice and equality? Where is there still room to grow? BS: The chasm that we have is like the difference between night and day. That’s why when I go through these periods of reflection, I always say: don’t get confused, we have to be clear about where we came from. Let’s be clear about the facts. And we need to elevate the facts in the data at every point that we can, because it’s horrendous, but it also helps people to understand: this is simply not right. When you take the big look at it: the disparities in terms of women from an economic standpoint, it goes as low as three percent and all the way up to 50 percent and on average up to 20 percent. below in terms of what women are making versus what men are making. This is not some ephemeral thing that people are talking about. This is like really real stuff. The gender inequities are deeply ingrained, they are systemic, and it is systems that have to be attacked. Whether we’re talking about transportation or any of the infrastructure sectors, let’s not be confused about how important it is for women to wind up being able to be elevated and full participants in these sectors. We’re talking about transportation, power, water, manufacturing, agriculture, and public health. Women are sadly underrepresented across the board in every single one of those sectors, and even when their representation has increased over the years, it is still woefully behind, and very much still concentrated in areas that are not the higher wage paying positions. Think about what I just said: infrastructure, transportation, power, all the utilities, the manufacturing sector, the water sector, the agriculture sector. I’ve just taken 50 per cent or more of what’s driving GDP in this country and saying, women are woefully behind. So when we start talking about what is the vision and where we have to go, there is no way that we are significantly going to impact the condition of women until we penetrate these major sectors that are driving of the economy. Pure and simple. Here, I do what to name and celebrate the work that Jobs to Move America is doing, because this whole notion of unapologetically and intentionally bringing an inclusion framework and making sure that every single dollar that we use to invest in infrastructure is at the same time being intentionally utilized to create jobs, business opportunities, and better infrastructure within communities, is exactly the business that we have to be about. Because that’s the only way that we’re going to wind up literally being able to change paradigms. It’s an all-out war. We need it at every level. And I think the other portion is that we cannot lose sight on the importance of compliance, compliance, compliance. Some people say: “we shouldn’t always have to have a hammer.” Well I’ll just say this: equal pay, equal work, making sure that sexual harassment is not something that’s okay. Those compliance measures and enforcement around compliance are absolutely critical because of the fear factor of simply loss of employment. I don’t think that these are areas where we can just sit at the table and just go along to get along. If you’re not at the table, you’re on the menu, and be clear about that. So I’m delighted with what’s happened with the current Congress, we have to have many more women that are sitting in these boardrooms, because it makes a difference when you’re sitting at the table — when you have enough sitting at the table and actually in a position to be able to advocate and bring personal experience and sensitivity to the discussion. Those are just some of the kinds of things that I think we still have a lot of work and room to do. LN: What do you hope to see as far as women’s involvement in terms of planning the future of transportation and infrastructure in the U.S.? AC: Well the first thing that I want to say is that I am so hopeful. I’ll start right here at home with Jobs to Move America. If you want inspiration about the future of transportation and infrastructure in the U.S., you should look at the staff page and see how many women and women of color are on staff and really thinking about and planning for our future. I’m also hopeful because last week, I was part of a convening in Washington, D.C. that was about how automated vehicles are going to impact the DC/Virginia/Maryland area, and as we went through putting together the panels, we put them together with great intentionality. We had two panels focused on the impacts that were all women. And this is really important because as I sit here, I have a pamphlet from an exhibit that’s about community development in Washington, D.C., and one of the pictures in the exhibit features president Eisenhower and an entire panel of about seven white men who are planning in 1958 for the urban renewal of Southwestern portions of DC. And they’re looking happily at the plans and thinking happily about what’s next. And resulting less than a year later is the destruction of whole communities of people of color. Because these men didn’t have any connection with the community, and they certainly could’ve used some women in the room to steer the conversation in a different direction. We know when women are in the room, the processes are much more participatory, they reflect local knowledge of longtime residents, they value people’s work and contributions and build that into what they deem the project to be successful. So, I have great hope from the leadership that we have in our nonprofit, government, and private sectors, and totally agree with Bev about the need to build that up even more and to make sure that the participation of women is meaningful and involves influencing major decisions. And lastly what I’ll say is, we have to remember the importance of organizing, grassroots organizing. Because grassroots organizing is not only the glue that holds together our communities and builds a vision that really is equitable, but grassroots organizing is also the accountability mechanism for our governments, nonprofits, and private sectors. As we build in diversity and inclusion and move towards equity, we have to invest our time, talent, and financial resources into our grassroots partners — to make sure that they who hold our moral compass are pushing us in the direction we need to go. And that’s the urgency and it gives me hope at the same time. BS: We have come a long way, but we still have so long to go. The areas I’d focus on is that we can’t do enough to stimulate young people particularly to actually be excited by these careers. Every single one of the areas I talked about, whether it’s transportation, water, power, all of them have major, major documented workforce issues and challenges, millions and millions of positions that they don’t know how they’re going to fill. On top of the fact that we know that everything is changing, technology is rapidly changing. One of the things that we must really do is make sure that our young people are really captivated and motivated by being a part of these careers. And what I would say on that end, really what I’ve had the ability to do over the course of 40 years is be in the business of community building. When you can bring that magical element to the table so that young people can understand that being in these careers, they have an ability to make decisions and influence decision-making that takes place. Where is the curb cut going to go? Where will the street lights go? Where does the tree cover go? Where do the pedestrian walkways go? What kind of energy are we going to wind using? When you bring that part to them so that they can honestly see that that is what you’re talking about, it’s very different proposition. The other piece of it is that community engagement, community participation, and community building: this has got to be a ground up on all of the pieces. This is generational work, these are generational investments, these are generational decisions. This is hard work, its lifetime work, but that’s the boots on the ground stuff. The other part is institutionalization. People are nice, personalities are nice, but nothing trumps statute, policy, procedure and institutionalization. Anybody who is sitting in a seat to make decisions has to understand that you will go one day, and if it is important you have to spend as much of your time ensuring that you actually leave that codified. Once again, deep and meaningful community engagement and participation — not just checking boxes — comes along with it a different way of understanding and respecting learned experience. We need learned experience of people, you don’t have to be a PhD to be a person who really understands what is needed within one’s community. I think that the more partnerships and working together that people do at all levels, the more that people respect the fact that even when you have the best of intentions, you cannot come into an area and plan for people. You must plan with them. And that means that you also benefit from what that deep learned experience is that’s just absolutely invaluable. We have to be active, we cannot sit back, and I know it’s hard and people get tired and we got so much to do. But there is nothing more important than the world that we live in and the society that we live and what we pass along and leave behind. And that is hard work and there’s nothing that’s going take the place of us being personally involved in that. We can and we will make a difference. Active participation and engagement are at all levels and accountability are absolutely critical. So, things like access to information and transparency as a matter of course, as how we do business. At the end of the day, we really do hold the pen as the people, and we need to do everything that we can to exercise those rights. Our focus at Jobs to Move America is on harnessing the power of public spending to build an equitable, climate-safe future and advance racial and gender justice. Linda Nguyen is the co-founder and deputy director of Jobs to Move America and was the driving force behind the expansion of the organization’s work nationally. Jobs to Move America is a national non-profit dedicated to ensuring that the billions of public dollars spent on American infrastructure create better results for our communities: good jobs, cleaner equipment, and more opportunity for historically marginalized people.